How A Florida Medical School Cares For Communities In Need : Shots - Health News Florida International University's medical school has made community-based health care a central part of its curriculum. With home visits and a mobile health clinic, students connect with families in neighborhoods where medical care is scarce. 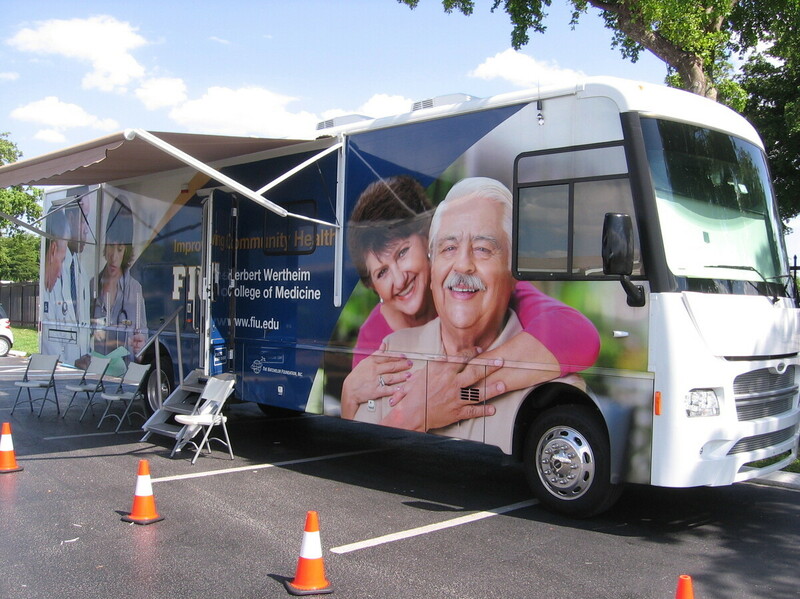 With community-based health care a central part of its curriculum, Florida International University's medical school turned an RV into a mobile health clinic so that students could treat families in neighborhoods where medical care is scare. Every Monday it's parked at the Royal Country Mobile Home Park in northwest Miami-Dade County. "It's a beautiful place right here," he says. "But this is not a wealthy community." Brown helps direct FIU's Neighborhood HELP program. It's part of the school's curriculum that connects medical students with families in neighborhoods where medical care is scarce. Students visit families in their homes where they conduct examinations and provide basic care. But some things are better done in a clinic. So the medical school bought its own RV. "We're able to bring free basic primary care to our households relatively close to their community," Brown says. In one of the RV's exam rooms, third-year medical student Veronica Alvarez met recently with patient Maritza Flores. Flores has diabetes and high blood pressure. With help from the school's faculty, Alvarez has been treating her since January. Flores says with Alvarez's encouragement, she's begun exercising more and has improved her diet. And, thanks to FIU's doctors, she's begun taking medication for her diabetes and high blood pressure. In just a few months, Alvarez says, she's seen a big improvement. "The high blood pressure and the diabetes together is what you worry about," Alvarez says. "And now, her diabetes is well-controlled and her hypertension is well-controlled as well." Over the last decade, a pressing need for new doctors has led many universities to open medical schools. Seventeen new schools have been accredited since 2005, and several are looking at new ways to train doctors. When it was founded just four years ago, Florida International University took on a mission — to improve the health of nearby communities. Another focus for the school is to train more doctors in primary care. Nationally, there's a shortage of primary care doctors — one that's expected to worsen as millions more Americans get access to health care under the Affordable Care Act. But Dr. John Rock, the medical school's dean, says the two missions go together. Sending students out to treat patients in their communities teaches them the art of primary care. FIU just graduated its first class from the medical school. Nearly half of the students, Rock says, are doing residencies in primary care. Several other new medical schools are also developing programs that allow students to develop ongoing relationships with patients. And there are others that, like FIU also have a social mission — to improve the quality of life in medically-underserved communities. In Miami, that includes places like Miami Gardens, where med student Danny Castellanos got to know a family that has 10 members, including a great-grandmother and five children. We're able to bring free basic primary care to our households relatively close to their community. Castellanos saw the family as part of a team that included a faculty advisor, a nursing student and a social worker. One of the first things they did was get all of the children qualified for Medicaid, which paid for their coverage. Over the three years, Castellanos became involved in the healthcare of the entire family, including most recently the great-grandmother. She's now taking part in a telemedicine pilot program. Castellanos says the school installed an electronic unit in the household. "It has a screen," he says. "It has a camera. It has a blood pressure cuff on it, a stethoscope which allows us to hear the heart sounds. We just ask her to place it in certain areas on her chest, ask her to put the blood pressure cuff on. And we get those kind of readings electronically." The telemedicine pilot will be evaluated for its cost-effectiveness. But, overall, FIU's Rock says the school's focus on improving the health of targeted communities already is a success. And for families in the program, the benefits are even more tangible. They're much more likely now to receive regular checkups and less likely to use emergency rooms. "We also have increased health literacy, so they have a keen understanding of what some of the issues are," Rock says.